I am convinced, that the best cosmetic is nature itself. The skin needs sun (they say, that is enough to reveal the face to the sun for only 20 minutes, so the body can produce enough of vitamin D for the whole day), water (a lot of water), clean air, sea and salt. But if you live next to dusty streets of big cities, thousands of kilometers away from the sea and you come back from work at sun set, you must help your skin differently. You have to clean, neutralize, nourish it and sometimes you even need much much more support. First, I smooth the skin and get rid of dead cells with peeling from Estée Lauder Perfectly Clean Fresh Balancing Exfoliator (75 ml, 54 USD), to prepare the skin for the appliance of the nourishing cream. It has been my second pack and I am extremely satisfied with it. Ideally you use it twice per week. After the peeling I use tonicum Vichy Normaderm Purifying Pore Tightening Lotion (200 ml, 13 USD). If you have problematic skin, the Normaderm line is exactly what you need. Tonicum closes pores and calms the skin. Moreover, it has a pleasant smell, such as Vichious. 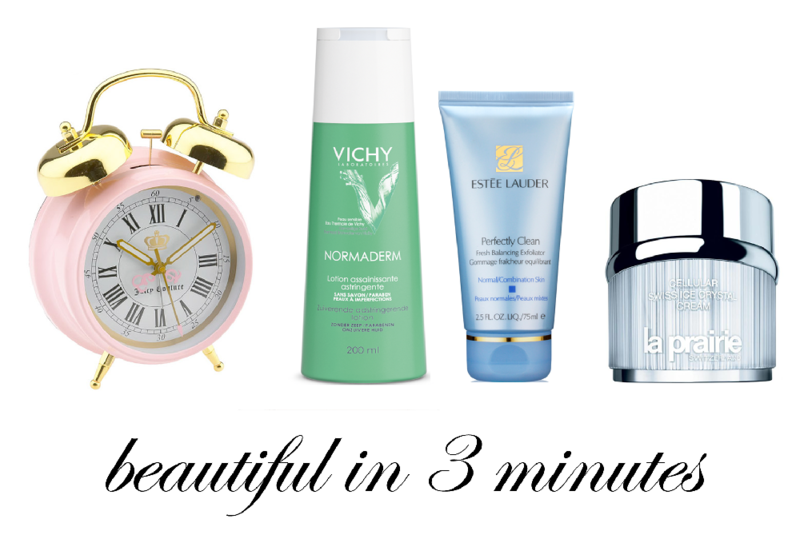 I am faithful to Vichy over 11 years and I tried several products and so far I got never disappointed. La Prairie Crystal Ice Cream (50 ml, 315 USD) is my last step of my morning routine. It is a bombastic product as you already know, because I wrote about it recently and should you have missed this post, you will find it here. The whole process takes less than three minutes, but for me it works like a miracle. Nikto ma nevyvedie z presvedčenia, že najlepšia kozmetika je príroda sama. Pleť potrebuje slnko (že vraj stačí odhaliť slnku tvár len na 20 minút, aby telo vyprodukovalo dostatok vitamínu D na jeden celý deň), vodu (veľa vody), čistý vzduch, more a jeho soľ. Ale ak bývate v zaprášenej ulici veľkomesta, tisícky kilometrov vzdialené od mora a z práce prichádzate, keď už slnko zapadá, musíte pleti pomôcť inak. Musíte ju vyčistiť, zneutralizovať a vyživiť. Ako prvé, pleť vyhladím a zbavím odumretých buniek peelingom Estée Lauder Perfectly Clean Fresh Balancing Exfoliator (75 ml, USD 54), aby som pleť pripravila na výživný krém. Je to už moje druhé balenie a nedám naňho dopustiť. Ideálne je použiť peeling 2 x za týždeň. Po peeelingu a hlavne v dňoch, kedy pleť nepeelingujem, jej doprajem tonikum Vichy Normaderm Purifying Pore Tightening Lotion (200 ml, USD 13). Ak máte problematickú pleť, tak rada Normaderm je presne pre vás. Tonikum uzavrie póry a pleť ukľudní. Navyše má príjemnú vôňu, takú višiovskú. Značke Vichy som verná presne 11 rokov a vyskúšala som niekoľko produktov a zatiaľ ma žiadny z nich nesklamal. Ako tretí na rad prichádza La Prairie Ice Crystal Cream (50 ml, USD 315). Že je bombový už viete, lebo som o ňom písala len nedávno a vy, čo ste tento post zmeškali, tak ho nájdete tu. Celý tento proces netrvá dlhšie než tri minúty a za tento krátky čas urobí s pleťou zázraky. That's a nice quick routine! Mine is much longer and more extensive. In the evening I quite enjoy having a lengthy skin care routine, but in the morning it can be quite annoying sometimes. Great morning routine, quick and effective! Mine is pretty similar- a facial wash gel, tonicum and a day cream. Great morning routine. Oh, i envy you with all those beauty products!! Good choice! Garnier or Bioderma micellar wather, spf cream and Olay day cream. Need to try the products you mentioned. Well taken care for morning routine. My pores need tightening. I would definitely check it out. I love your morning routine because it is so easy to follow. Wow! Thank you for the tips. Your routine is terrific! Mine involves using Simple Micellar Cleansing Water, followed by May Coop Raw Sauce, and Korres Black Pine Day Cream. My morning routine is a lot like this!